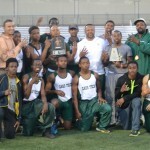 Cass Tech swept boys’ and girls’ team honors at the 2014 Detroit Public School League track and field meet May 22 at Renaissance High School. In addition to Coach Thomas Wilcher’s Technicians and Coach Chris Wright’s Lady Technicians doubling their pleasure, both meets had three individuals emerge as double champions. Among the boys, Western’s Juan Flores won the 1600 and 800, King’s Tyrell Stephens won the 110 meter hurdles and 300 hurdles and Southeastern’s Brandon Mitchell won the 100 and 200. In the girls’ meet, East English Village’s Latona Turner won the 1600 and 800, Renaissance’s Dominique Taylor won the 100 meter hurdles and 300 meter hurdles and Cass Tech’s Simonae Dismuke won the 200 and the 400. 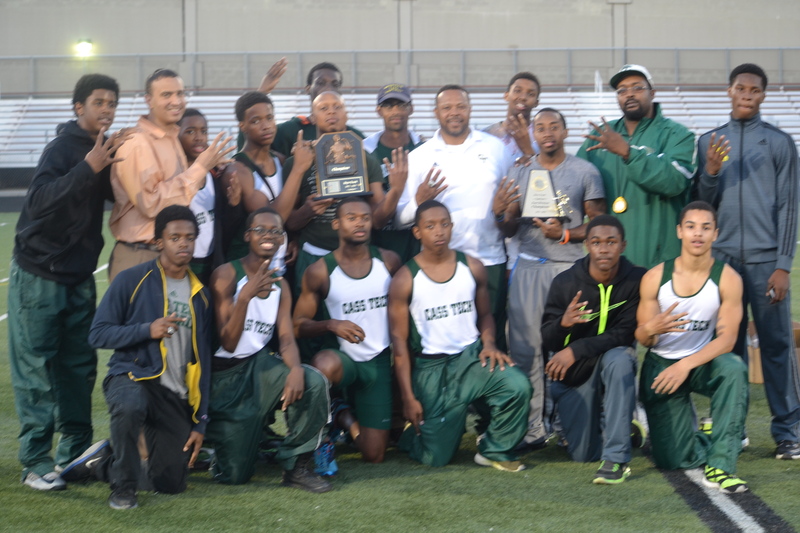 East English Village’s boys earned victories in three of the four relays, including the 4×200, the 4×100 and the 4×400, while Cass Tech’s boys won the 4×800. Other boys champs: East English Village’s Anton Curtis (400); Denby’s Hakeem Weatherspoon (800); Renaissance’s Mark Wilson (high jump); East English Village’s Isaiah Griffith (long jump); East English Village’s Xavier Bolt (discus); East English’s Terrance Ingram (shot put). 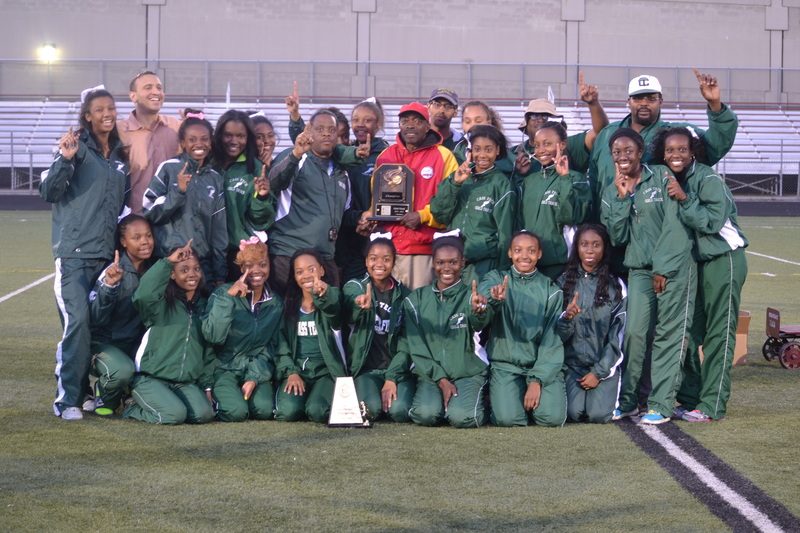 Cass Tech’s girls won the 4×800, 4×100 and 4×400, while Renaissance prevented a relay sweep with a victory in the 4×200. Other girls’ champs: Renaissance’s Dominique Funchess (100), Renaissance’s Leah Spivey (3200), King’s Barbara Venson (high jump), King’s Michelle Glover (long jump), Osborn’s T’Asia Moore (discus) and King’s Gwendolyn Aikens (shot put). The girls’ and boys’ track preliminaries and field event finals were held Monday, May 19, at Renaissance. The girls’ team scoring was led by Cass Tech’s 183 points followed by Renaissance 130, King 128, Osborn 31, DCP-Northwestern 25, Pershing 22, East English Village 20, DIA and Denby 14 apiece, Cody 13, Mumford 11, Southeastern 2. The boys’ team scoring was led by Cass Tech’s 151 points followed by East English Village 78, King and Renaissance 76 apiece, Cody 63, Southeastern 36, Denby 32, Mumford 24, DCP-Northwestern 23, Western 22, Osborn 9, Ford 8, CMA and Pershing 5 apiece, Douglass 4.